If you're looking for something as a gift for a wannabe gardener, this could be the very thing. 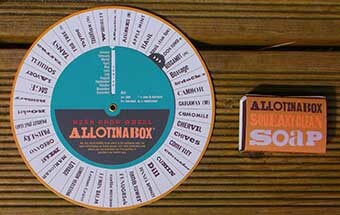 If you’re looking for a present for someone who is interested in starting gardening, Allotinabox could be the gift you’re looking for. A Grow Your Own gift box contains a collection of seeds that can be grown in an area as small as a window box. I was sent a ‘Grow all Seasons’ GYO Box. The beautifully presented box contains a variety of seeds and some accessories. Allotinabox gets top marks for presentation. Wrapped in decorative paper and delivered in a biodegradeable box, the container is as green as the contents. The seeds in the box were a good selection. Aubergines, Parsley, Rocket, Mange Tout and British Thyme – all of which can be started off on a window ledge. It’s not just seeds in the box. 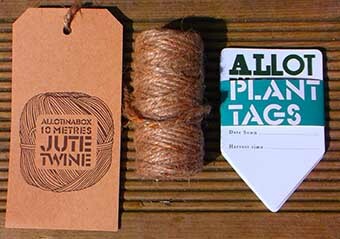 The pack contains 10 metres of Jute Twine, 5 plant tags, a Herb Grow Wheel that tells you all you need to know about sowing and harvesting fresh home grown herbs and a bar of Handmade ‘Scrubs Up’ soap. And now the fun begins! My daughters have planted sunflower seeds in the garden but this was a good opportunity to develop that knowledge and get them more involved with gardening. We set about preparing the pots. 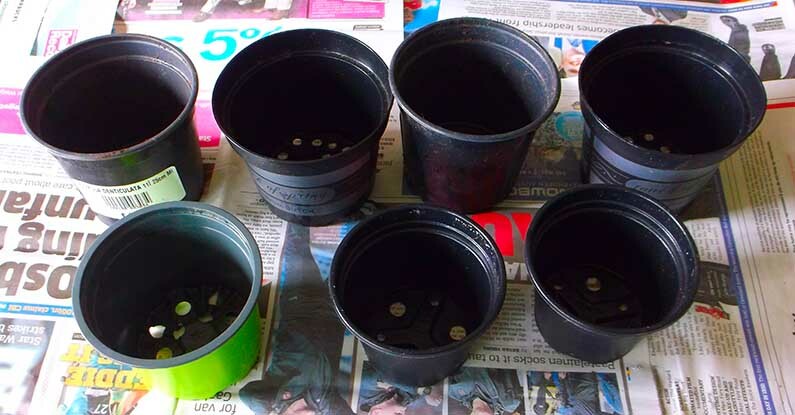 The girls helped fill the pots and drop the seeds into the soil. They even named the seeds as they planted them! Once the seeds begin to grow, we’ll thin them out and put them in a large planter in the garden. The children see the growth of plants as nothing short of magic, which is an accurate description! 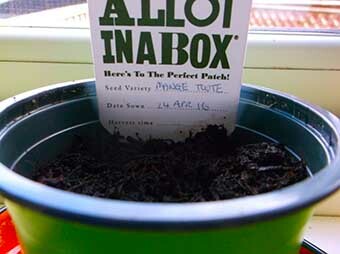 This was a Seasonal Grow Your Own box from Allotinabox and retails at £15.99. For £11.99, they also offer a Super Seed Box which is a “brilliant booster pack for any enthusiastic grower, or a leg up for a complete beginner”. 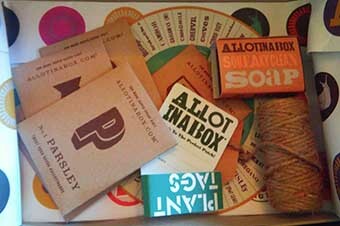 The people at Allotinabox are offering you the chance to win the box that I received – the Seasonal Grow Your Own box. Wahey! Simply enter using the Gleam widget below before the closing date of 21 May 2016. Easy! 1. 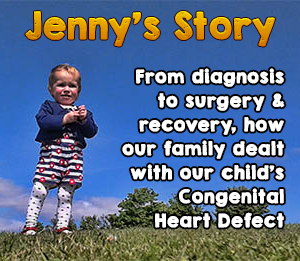 Closing date is 21 May 2016 at midnight. 2. 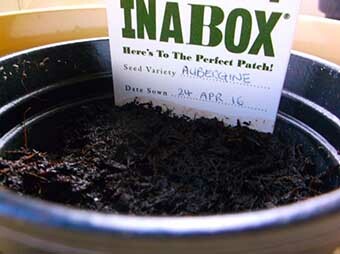 The prize is a Seasonal Grow Your Own box from Allotinabox as featured above. 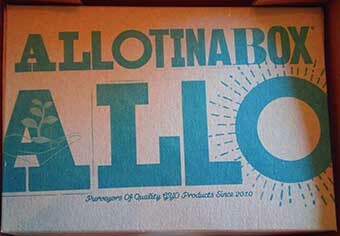 Disclaimer: We were sent this box by Allotinabox for the purposes of this feature. Looks fab. I would love a box of all herbs. I love growing all types of chillies ranging from mild to very hot and they come in all sorts of colours too. Have grown tomatoes, peppers, strawberries and potatoes before. Artichokes – love the look and taste of them. I grew tomatoes once and they were the tastiest I have ever had, I would like to start growing some vegetables with my daughters. I have home grown carrots with my girls they were pretty impressive. For me to grow anything is impressive, so it has to be strawberries in a hanging basket….. they were very small and the kids realised pretty quickly if they gave them to the neighbour’s kids they would get huge M&S ones in return!!! Purple french beans were pretty unusual and great tasting too. Must grow some of them again. A pumpkin which was so big it took two of us to get it in and out of the car. An apple tree from an apple core! It even produces tiny apples now. Perfect home warming gift for my daughter’s new garden….her love for home grown veg is blossoming ! Kale sprouts are her favourite. Tomatoes! We can’t grow a huge amount as our balcony is only small. Rhubarb whose leaves were the size of elephant ears! I once grew an aubergine. I love growing things, unfortunately my greenhouse is empty this year! One tiny aubergine – but I was everso pleased with it! I was most impressed with myself when I managed to grow an aubergine one year. Tomatillos. I was so fed up of planting tomatoes and them getting blight, aphids, was so demoralising. The tomatilloes were great, I sowed 4 seeds and they all grew. Planted the 3 strongest in a growbag and they grew quite happily with no pests. Okay, so maybe the fruit never ripened fully, but they made great green chutney. Yeah, pretty impressive I would say! Only watercress (pathetic, I know). I managed to grow some broccoli once unfortunately they were covered in caterpillar’s! A cherry tree in our back garden but the birds usually get to them first. After years of trying (and swearing that this would be my last go), I finally managed to grow cucumbers last year, I was overrun with them! erm….hmmmm…well….never actually grown anything yet. in my last house I had a grapevine that climbed up the back of the house and on to the roof! Giant onions! I came 4th in the Mickleby Onion Society competition. My beard it was very impressive unti i met my partner ! Nothing yet but this year I’m growing tomatoes, chillis, carrots, strawberries, spring onions, herbs & peppers. Nothing like going for it first time out! havent yet but would love to grow my own tomatoes, herbs and chillies next year! ive never managed to grow anything myself. when I was little my dad used to grow, veg and strawberries, I used to love help pick the pea pods, not many made it back to the house, I love fresh peas raw. I sprouted mung beans. Which is harder than it sounds if you haven’t got the kit, because they go all foosty if you aren’t careful. Also I have made my own yogurt without a yogurt maker, and that is probably technically growing a fungus. On the subject of growing yeast, you should have seen the size my Herman the German starter dough got too. I’ve grown money maker tomatoes before, and they were delicious. Much better than the ones from the shops. Strawberries and pumpkins – I’m not very green fingered! Some tatties and carrots, I’m very much a starter so nothing too impressive yet ???? I’m not known for my green fingers – does a cress head count? Rhubarb. Luckily it almost looks after itself, but I planed it from a small crown and now it’s lovely and produces lots of fresh fruit. Got some great asparagus this year (the third year after we planted them and the first year that we have cut any). A 60lb pumpkin when i was a kid! I’m always trying to grow edible plants, figs, potatoes, rhubarb, strawberries, gooseberries, cherries, herbs, tomatoes, peas and beans, onions, ginger, asparagus to date, I also have a lemon tree, an orange tree, a pomegranate bush, a pineapple guava bush and an olive tree but have not had any edible fruit from them so far. My dream is to grow my own vanilla pods from a vanilla orchid. A cucumber, was impressive because I thought it was a courgette plant! Though my brother was amazed that they tasted like strawberry!! I think it must be the apricots although this year there are none due to the late frosts. Strawberries – in a garden that often has a lot of slugs. My little boy would love to see some things grow from scratch! Pumpkins! They are so easy to grow and I never imagined they would turn out so big! A melon, it was very small though! I’m unsure if it’s impressive but I loved growing my own Strawberry plant when I was 13! We’re had them in the garden ever since! I once planted a handful of chilli seeds and literally ended up with hundreds!!!!! I’ve grown chillies, had so many we were running out of things to do with them – which was nice! We had a bumper crop of runner beans last year – we had a crop until around late October/November. Im a beginner. I want ti encourage my son and neice to grow things. Nothing, I’m terrible at growing things! My dad grows strawberries and tomatoes in his greenhouse, he is a keen gardener. I’ve grown tomatoes before, not that exotic I know but the volume we had was immense. No one left our house without taking a bag of them away! I grew cucumbers last year, it was my fifth year of trying (with no previous success), I have no idea what I did right, but I ended up with enough to feed half the street! last year we had herbs, tomatoes, spring onions and carrots – i was pretty impressed! An amazing climbing pumpkin which had to be cut out of the top of a tree! Got a few things growing but the snails seem to like everything! Sunflowers that were taller than my husband. Strawberries that started to take over the garden. Then we moved. Now I need to start over. The year before last, we got a huge crop of courgettes, which went on for the whole summer. we then made the mistake of using a larger bed the following year, hoping for a repeat bumper crop, but instead got only a couple of courgettes a week . This year we’re moving house so will have to wait and see if we pick a good spot. This a great idea & would make a fab present for someone . I’ve grown some marrows that were quite impressive – they were huge! We had some lovely raspberries last year . They were delicious . I grew red (not too hot for me) chilli peppers from seed. It was very exciting!